Coder Child and Enjoy-Up games have today announced that upcoming 3DS eShop title, Dress To Play: Magic Bubbles, will burst onto the virtual store in North America this month, on 16th May. Similar to Dress To Play: Cute Witches, the game allows you to accessorise your own character - male or female - as you wish. There are thousands of ways to create your character; pink hair, purple hair, you name it, it's all there. Once your doppelganger is created, embark on a wondrous adventure involving a powerful washing machine and bubbles — a strange combination, but that's how this game rolls. You unlock plenty more prizes and clothes for your dressing room the more you play. 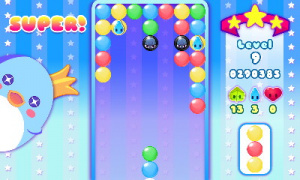 The game features a two-player mode using the same 3DS, where you can challenge a friend and beat them by capturing more bubbles. Dress To Play: Magic Bubbles will be available for download at the fine price of $3.99. Will you purchase the game when it's released next week? As always, let us know by leaving a magical comment below. Looks like a duller version of Magical Drop to me. ^^ I was going to say a baby version of Bust-a-Move, but Magical Drop seems closer. Looks a lot better than the previous game, this one might even end up in my 3DS if the conditions are right. What's the point of the dressing part if you don't even use the character you dressed like in the previous game? The first game was mildly enjoyable, but too limited. A puzzle game core should make this a more robust and replayable package. It is far away from Magical Drop. It is a mix of elements. The nearest common known Puzzler is Puyo Puyo/ Puyo Pop - but upside down. This actually looks good. The first was OK but too limited - this looks much improved!